How would you like to commute to work on an outdoor escalator carved into a mountain? Thousands do every day in Hong Kong. The Midlevels escalator is actually a series of covered escalators and moving sidewalks about a half-mile long. It is the longest outdoor escalator in the world. The escalator starts at Midlevels, an upscale residential area popular with expats, and ends in Central, which is home to the city’s financial district. The ride from top to bottom is about 20 minutes long. During rush hour it runs down hill full of business people heading to work. At about 10:30 a.m. it reverses and transports people up the mountain for the rest of the day. It shuts down around midnight. For residents there are small shops along the way to stop off and pick up a few things at the end of a long work day before heading home. Restaurants, watering holes, coffee shops and a health club to fit in a workout also line the way. 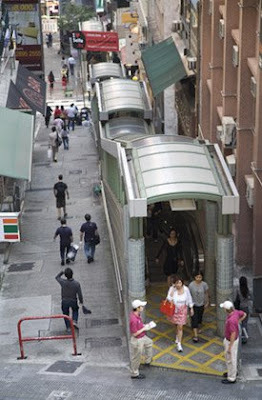 For visitors to Hong Kong riding the Midlevels escalator is like taking a cultural tour. You’ll see the iconic hanging laundry in tenement windows so close at some points you can almost reach out and touch it. Wet markets bustle with activity below in Sheung Wan, a traditional part of the city. A separate post on this neighborhood will follow. Starting at the top of the escalator you’ll pass by Mosque Street, named for the Jamia Mosque. The gate to the walled mosque is typically open making it possible to peek inside. Further down is Hollywood Road, which is full of curios and antique shops as well as chic home décor stores. If you get off at Hollywood Road to browse and shop walk east (away from the escalator) for about five minutes to admire the Man Mo Temple. Ride the escalator further down and you’ll hit Soho, short for South of Hollywood Road. This area on Shelley, Staunton and Elgin Streets is popular for its restaurants, night life and art galleries and is a good place to make a pit stop to refuel. Or continue into Central to carry on exploring the city’s sights. Hi Lakshmi-That makes two of us! Hi Philip-Glad you found it interesting. wow! Thats pretty cool. It's futuristic. I recommend giving it a whirl if you get the chance. Fascinating! I missed that while I was in Hong Kong. Anne-Who knew an escalator ride could be so interesting. Interesting. I've never seen anything like this before!